Colcannon is a traditional Irish mashed potato recipe with kale and scallions. 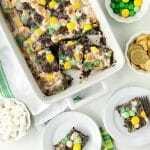 It’s irresistibly delicious and perfect for St. Patrick’s Day too. 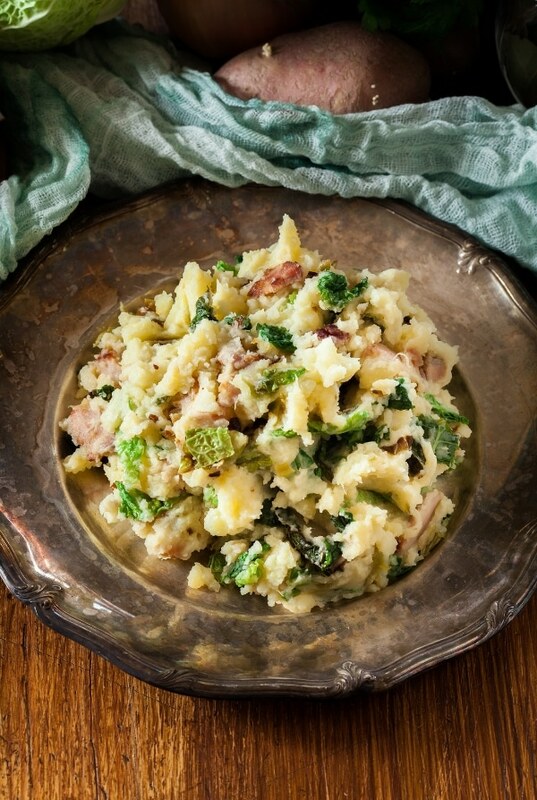 Colcannon is a traditional Irish mashed potato recipe, perfect for St. Patrick’s Day. With only five ingredients this dish is easy to whip up and a great authentic Irish dish. It’s a familiar cousin to the iconic American comfort food, mashed potatoes. Colcannon is a traditional Irish recipe of mashed potatoes with kale or cabbage, scallions and butter. Some recipes include milk or cream; some do not (this does not). It also can contain other ingredients in the onion family such as leeks or chives. Like many traditional recipes, there are family or regional variations, such as including boiled ham or bacon. 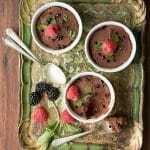 It’s a hearty, affordable recipe that is particularly satisfying in the cold weather months. Colcannon recipe have many variations based on family traditions. The version pictured here includes bacon. 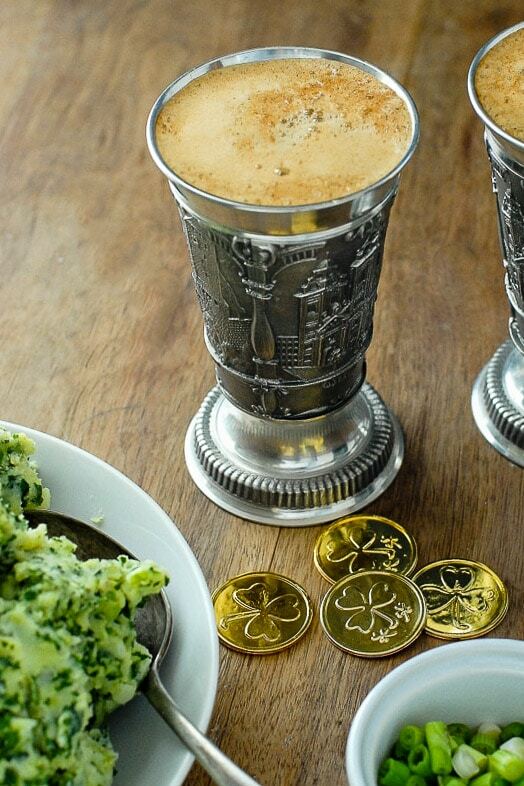 Colcannon is traditionally served in Ireland on Halloween with charms hidden in it! The charms are simple but with significant meanings foretelling future events! What Type of Potatoes to Use for Colcannon? 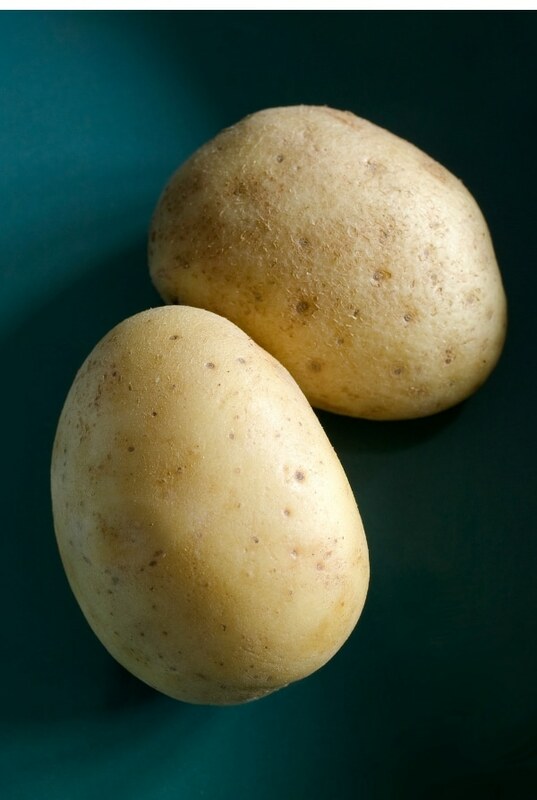 In a traditional Irish Colcannon recipe, ‘floury’ potatoes would be used. The closest in the United States would be a russet potato. Though Yukon Gold potatoes may not be an indigenous Irish potato variety, their creamy nature makes this traditional Colcannon recipe perfection. 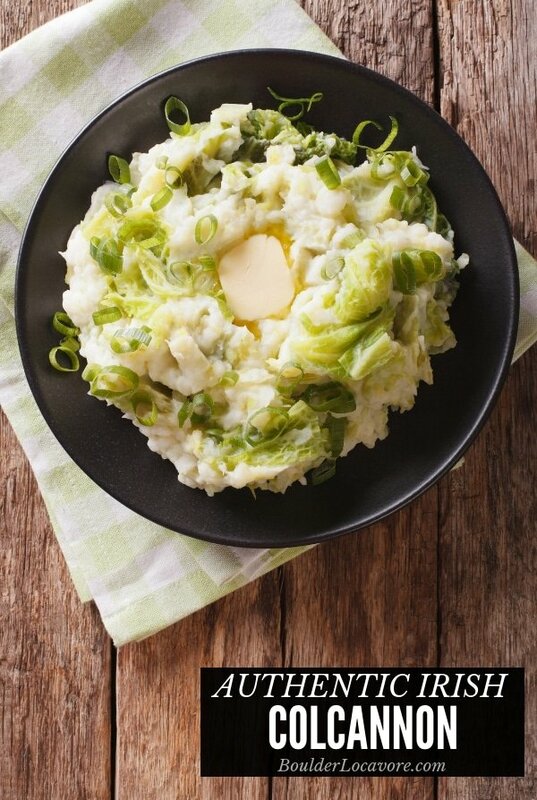 Colcannon is perfect traditional dish for celebrating St. Patrick’s Day. What Does Colcannon Taste Like? If you have not enjoyed it before you may imagine a strong taste of kale making it seem like more of a “green vegetable” dish. The curly kale is lightly blanched and processed with the scallions before incorporating into the buttery potatoes. The heady aroma of the kale and onion when freshly diced coming out of the food processor is truly divine; light, fresh and singing of springtime. This Colcannon recipe is truly irresistible. Hold the end of the kale stalk (the stem) in one hand. With the other hand, place the thumb and forefinger at the base of the leaves on the stalk. Pull the stalk with the first hand (the hand holding the stem), holding the other thumb and forefinger firmly in place. Leaves will peel off the stalk easily and are ready for chopping. Specific recipe instructions are in the recipe card at the bottom of the post. Fill a large pot with enough water to cover the potatoes by at least an inch (the potatoes should have plenty of room) and bring to a boil. Place the potatoes into the boiling water until done (about 20 minutes). Drain and return to the pot. While the potatoes are cooking….bring a second pot of water to a boil (for blanching the kale). Set up a large mixing bowl of cold water and ice. Place the kale into the boiling water for 2 minutes; remove with a slotted spoon and place in the ice water for 2 minutes. 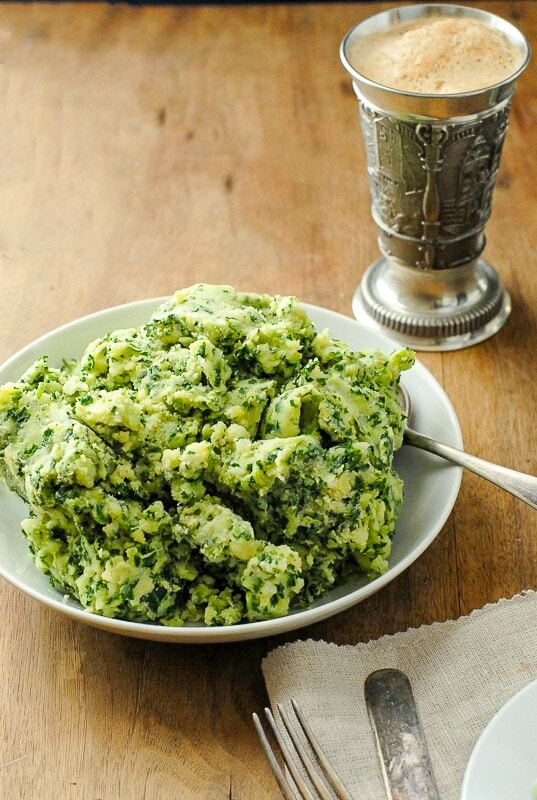 Combine the blanched kale and scallions in a food processor. Pulse until the mixture is finely diced. Add the butter to the potatoes and allow it to melt. Mash the potatoes and stir in the kale and scallions. Potato ricers make quick work of mashing potatoes creating a light and creamy texture. This photo is from a different potato recipe but you can see the results when mashing potatoes with the skin on. The skins are filtered inside the ricer leaving just the potatoes. The Colcannon may be mashed with a traditional potato masher or a potato ricer,which is my preferred method. 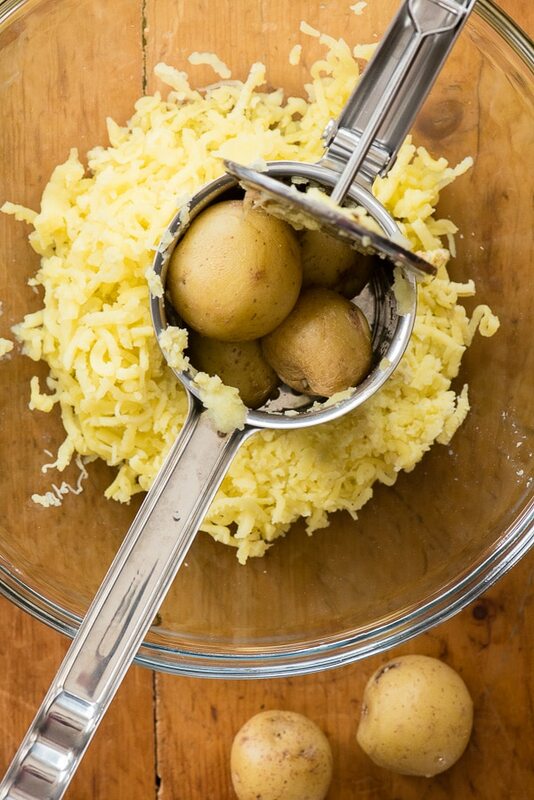 If you have not used a potato ricer, it makes quick work of mashing potatoes and gives them a wonderful texture. Potato Ricers come with a few disks with different sized holes which are fitted into the end of the cylinder. How Does a Potato Ricer Work? Add potatoes to the main cavity fitted with disk. Pull the handles together which depresses a solid metal piece forcing the cooked potatoes through the perforated disk. Milk (or cream in some cases) is another variable ingredient in Colcannon. The type of potatoes used may affect how moist the Colcannon recipe turns out. If desired to make a lighter, creamier Colcannon, feel free to add a bit of warm milk in the last step. 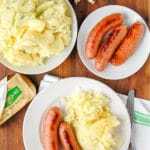 Did you make this Authentic Irish Colcannon recipe? If so, please RATE THE RECIPE below! 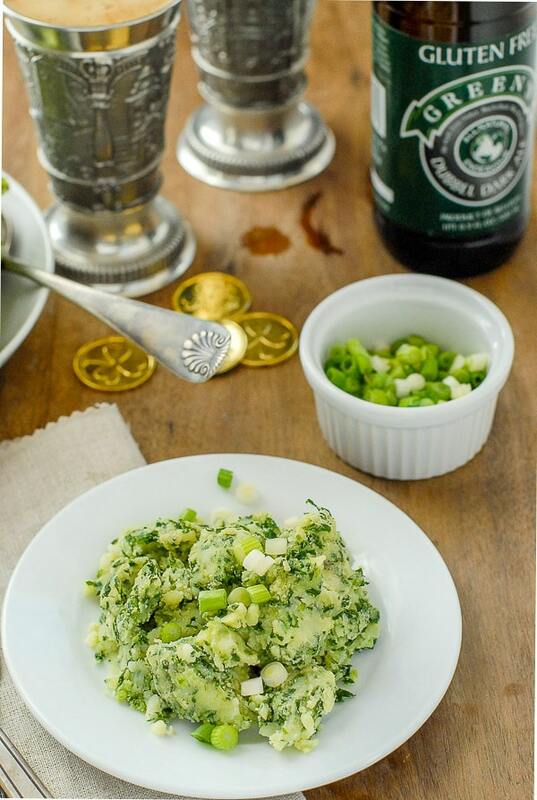 Colcannon is a traditional dish for St. Patrick’s Day, combining the beloved potato, kale, scallions and butter. Try it once and you’ll be hooked! Fill a large pot of water with enough room to cover the potatoes by 1 inch (with plenty of room for the potatoes). Bring to a boil. Add a large pinch of salt to the boiling water. Place potatoes in boiling water until done (about 20 minutes; poke a fork in them to ensure they are no longer hard and are cooked through). Drain and return to cooking pot. While potatoes are boiling, bring a second pot of water to boil for blanching the kale and fill a large mixing bowl of ice and water. Place the kale leaves into the boiling water for two minutes, stirring occasionally to ensure they all become submerged. Remove from boiling water, and place immediately into ice water bath. Allow them to remain there for two minutes then place them in the bowl of a food processor. Add the rough chopped scallions to the bowl of the food processor. Pulse for 10-15 seconds until kale and onions form a finely diced mixture. Add the stick of butter to the potatoes; mix together to allow butter to melt. 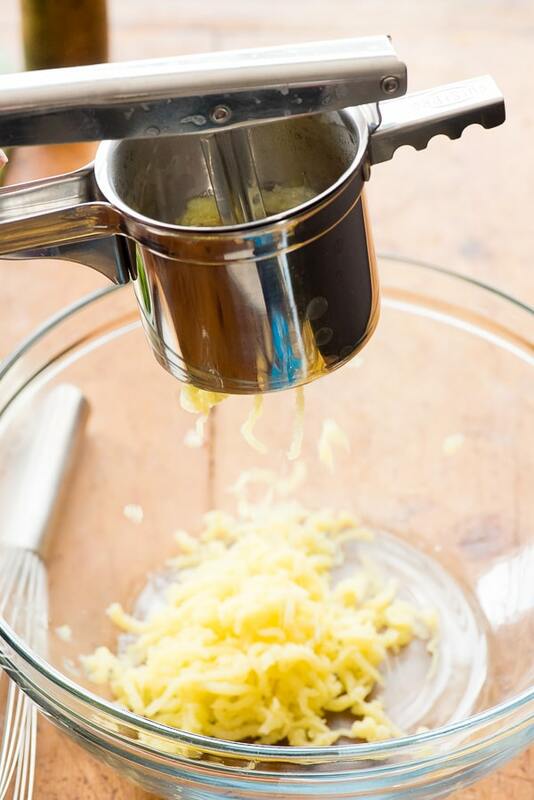 Once the butter is melted, mash the potatoes with a masher or potato ricer. Add the diced kale and scallion;stir to fully combine. Serve hot garnished with scallion slices. I have made mashed potatoes with scallions before and added in some crispy bacon bits. I will try making this Calcannon recipe too. Adding kale makes it really healthy! My picky eaters don’t usually like mashed potatoes (I think it’s the texture) but I think they could devour this dish no problem! I know I could! Who doesn’t love loaded potatoes?! This looks awesome; I could make this a meal in it of itself! This looks delicious. The addition of kale to the potatoes is intriguing. May have to add to my St. Patricks day menu. Thanks for sharing! 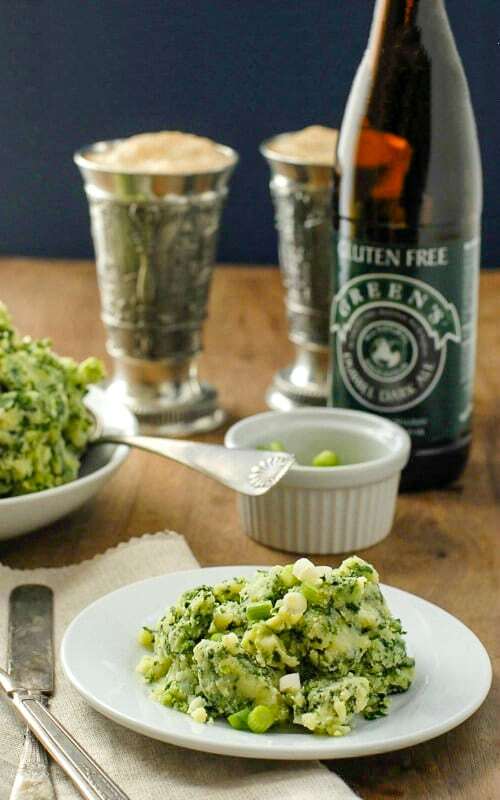 Authentic Irish Colcannon Recipe looks like very easy to make. I hope I can do it this weekend. This looks so simple to make. I am going to try out this mashed potato recipe this weekend. Where has Colcannon been all my life? It looks delicious and brings together a few of my favorite foods. I’ll definitely be making some soon. I’ve never heard of this dish, but I’m ready to try it. I printed it out and will get everything tomorrow! 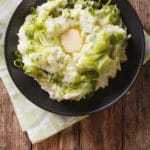 Irish colcannon looks so delicous and I would love to try your recipe in this cold weather like today. It amazes me that so little ingredients is needed for this dish and so easy to make. These are irresistible! So glad I tried this recipe. These are the best mashed potatoes! What an awesome side dish. Kale is so healthy, and adds a little something to the recipe. Sounds excellent with corned beef and some green beer! Green beer is definitely an American thing, not an Irish thing. 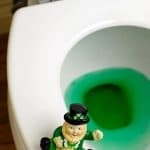 But my friends in Ireland have said the wild festivities in the US are spreading back to the motherland a bit as St. Patrick’s Day is traditionally a religious holiday in Ireland. This looks soooo delicious. I come from an Irish family so I love this kind of stuff. I try not to eat too much of it though because I’m getting a little belly!